The International Association for Asia Pacific Studies (IAAPS) is organizing its 5th Annual Conference in collaboration with United Nations Economic and Social Commission for Asia and the Pacific (ESCAP) East and North-East Asia Office (ENEA) and the Ritsumeikan Asia Pacific University (APU). The Conference is to be held on Thursday, November 27 – Friday, November 28, 2014 at the UN ESCAP-ENEA Office, Incheon, Republic of Korea. The International Association for Asia Pacific Studies (IAAPS) is organizing its 5th Annual Conference in collaboration with United Nations Economic and Social Commission for Asia and the Pacific (UN ESCAP) East and North-East Asia Office (ENEA) and Ritsumeikan Asia Pacific University (APU). The conference is to be held on Thursday, November 27 and Friday, November 28, 2014 at the UN ESCAP-ENEA Office, Incheon, Republic of Korea. We invite presenters (both panels and individual presentations) for the 5th IAAPS Annual Conference. What are the geo-political consequences of growing regional integration in the Asia-Pacific region? What are the social, political and economic issues emanating from regional integration across countries, sub-regions and within countries? Who are the key players and what interactive linkages within and outside the region are expected to be forged as a result of this transformation? Has regional integration caused problems to groups and individuals? How are families and individuals involved and affected by the forces of regional integration? The IAAPS 2014 Annual Conference invites papers that will address the above questions and many more through the conference theme of “Regional Integration in the Asia Pacific Region”. We are looking for panel and individual presentations that can address the theoretical or empirical dimensions of the issues. Interdisciplinary panels are most welcome as issues are discussed from the disciplines of international relations, sociology, anthropology, history, music, literature, finance, economics, politics, linguistics, science, non-traditional security, human security, demography, health, aging, geography and related concerns. If you would like to be a presenter, please click below to enter your information and submit your abstract (maximum 250 words). The Application Deadline has already passed. If you are currently not an IAAPS member, please become a member by following the instructions at the website listed below. 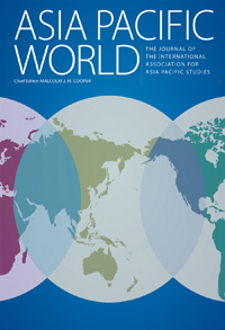 To become an IAAPS member, you will be asked to pay a subscription fee for our journal, Asia Pacific World, published by Berghahn Books, Inc. You can subscribe to the journal via the publisher’s website. An individual membership is 80 USD, and a student membership is 35 USD. These membership fees include a one-year subscription to the journal (the student membership allows online access only). If you already have a valid IAAPS membership, you do not need to do this online registration. If you become an IAAPS member by September 30, we will discount the conference registration fee from USD 100 to USD 80, which will be collected at the venue. *Please note that those who did not become an IAAPS member by September 30 will be paying USD 100 at the venue. *This registration fee includes meals, coffee and snacks, and the proceedings. Both presenters and audience members will pay the registration fee. Registration Deadline has already passed. Successful applicants must upload their summary paper by the deadline by using the form below. To upload, a password is required. Your password will be sent together with the acceptance notice via email. In uploading your summary paper, please make the file name the same as your name. Please note that if multiple files with the exact same name are uploaded, an older file will be overwritten by a newer one. If you would like to upload multiple files, please add a number after your name in the file name and use a different number for each separate file. Submission Deadline has already passed. Proceedings (uploaded on February 4) New!! Every visitor to the Republic of Korea must have a valid passport and visa. Visitors with round-trip tickets from countries which have special agreements with the host country may be exempt from the visa requirement. Such visitors may stay in the Republic of Korea visa-free for periods up to 30 days or 90 days, depending on the type of agreement. For details of visa requirements, participants are advised to consult the local embassy/diplomatic mission of the Republic of Korea or visit the following website: www.immigration.go.kr/indeximmeng.html. Visas will be issued by the embassies and/or diplomatic missions of the Republic of Korea. * Participants should book their own accommodation. * Please be advised that actual times may vary depending on traffic conditions. There are two kinds of taxis–regular and deluxe. Fares are based on a combination of distance and time. If you ride a regular taxi between midnight and 4 am, you will pay 20 per cent more than regular fares. Taxi Stands Taxi Stand for the conference venue is located on the arrival level (1F) at the passenger terminal platform 7C. Estimated travel time About 20-25 min. ESCAP, APU, and IAAPS will not be responsible for personal accidents or damage to the private property of participants. Participants are advised to make their own arrangements for personal insurance. No vaccinations are required in order to enter the Republic of Korea. Indoor smoking is strictly prohibited in the conference venue and in most buildings and public places in the Republic of Korea. Participants are allowed to smoke only in designated smoking areas outside the conference venue. The conference will be conducted in English. Incheon time is nine hours ahead of Greenwich Mean Time (GMT+9).